We will try to update this page as often as we can. Please check back occasionally, to see how we are doing. 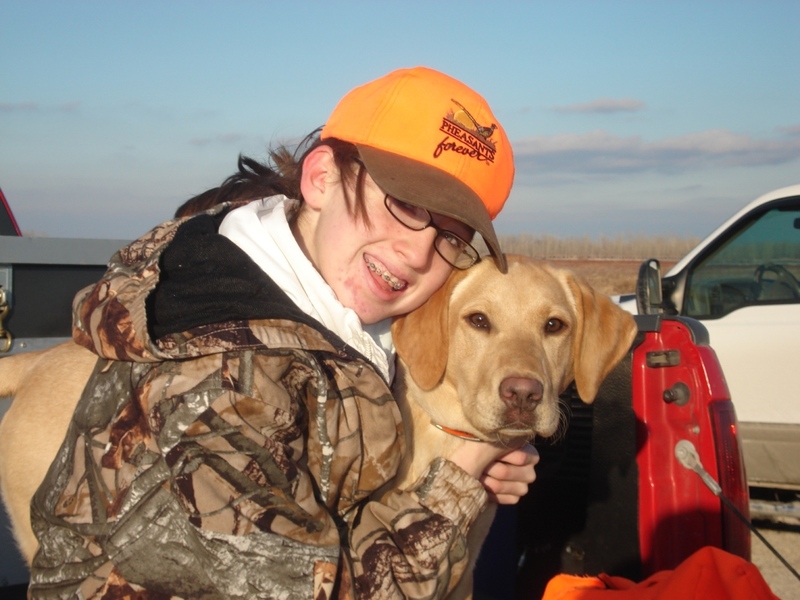 13 year old Jane, with her 6 months old Cody x Chloe pup "Star" after a Kansas Pheasant hunt. Cooper didn't retrieve all these but he certain did his share. He is doing extremely well. Blind manners are great and his drive is outstanding. Thanks for producing such a wonderful pup. I am as excited about his future as any dog I have ever owned. It was amazing to watch the lights come on as the training became hunting. I will try to send you some more as we go through the season. Dewey's vet checks have been good and all is well. I just wanted to let you know how well things are going. He is just a pleasure and everything I wanted in a pup. He has learned to sit, sit-stay, leave it and I have been slowly and for a brief periods getting him used to the puppy lead...particularly when we go to the road to get the paper in the morning. He is by far the furthest along of any dog that I have owned. We also get along well with each other which is a big plus. If you ever need someone to give a testimonial regarding your pups, feel free to send them my way. Hope all is well with you and your family. Thanks again for everything. Have a great summer. Just wanted to give you an update on Jake. We could just not possibly be more happy. This is just one unbelievable pup. He has far exceeded all of our expectations. We aren't getting too serious with the training as of yet. It's all just been fun, and games to this point. But, he has already learned; Sit/Down/Stay/Come. To Voice and Whistle. He quickly picked up "Over's" with hand signals, in each direction. On to "Back" next..... 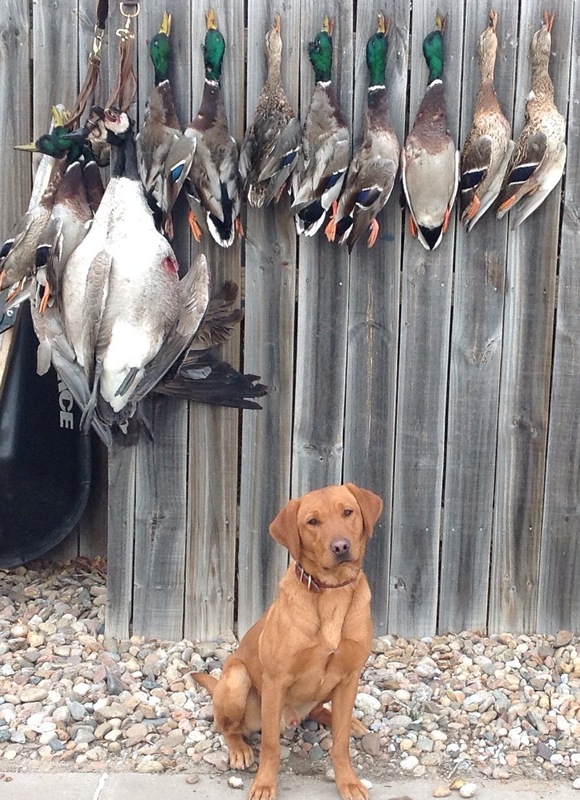 Still limiting the retrieve's to a couple every few day's. And, he only get's a small percentage of what's thrown. A Buddy of Mine is about ready to get a pup himself. He will be giving you a call. Again, thanks for everything. We are just tickled to death with this little guy. I just wanted to give you an update on Chip. He is by far the smartest dog that I have ever owned. In only a couple months has mastered sit, stay, come, heel, kennel, & lay. He also retrieves on command, hunts on command, and is catching on quickly to hand signals. However, the greatest aspect of this dog is his temperament. He allows my 10 month boy to maul / pet him and does nothing but smile and lick. Chip has a great drive and desire to please. He has exceeded all expectations and continues to impress everyone he meets. Lastly, thanks for the training advice. It worked great! I hope to keep in touch with you. As this will be the first dog that I train on my own and will most likely have additional questions. Just wanted to update you on the Gus's progress... Thus far I couldn't be happier with his demeanor thus far. Weather its been house breaking, first time on the lead, socializing with larger dogs or riding in the truck he handles all situation with ease. Vet commented that he's the mark of a flawless lab... Which is a testament of you breeding practice. As far as his progress in the field he quite honestly he handles like a sports car. As the video clips above will show. I don't know that I ever had a 9 week old bring to hand like he did/is... The the second video is of pour quality due to Miller lites on my neighbors behalf but if you notice the second toss gets away and turns into a true blind... he handles as though it was 10 yards in front of him. He'll visit with a trainer in Louisiana in December if its not a good fit for Gus or the trainer I may look at your guy in Kansas. Either way I expect he'll be ready for Pheasant in Nebraska, ducks in Louisiana or quail in south Texas in short order. I'll keep you posted as to his progress... and if you have any update on his siblings please pass along I'd like to keep up for curiosity's sake. Ruby - 4-month's old. First Pheasant Hunt. Nebraska. Just thought you might enjoy seeing this. Ruby's first hunt at 4 month's old. She flushed, and retrieved two Rooster's. She's a hunting machine. But yet she is also extremely quiet, and fun around the house. She is absolutely beautiful. Couldn't have asked for a prettier dog. I'll be back to do more business in the next couple year. I'll contact you early to make sure I get on the list. I will also be sending a few other people I know your way. Just thinking you might want to see these. Wyatt is doing very well. He pick's up new things incredibly fast. I'm just trying really hard not to move too fast in his training. He get's a little car sick once in a while. Thinking he will out grow that. Hope everything is going good west of here. All is well in Omaha. 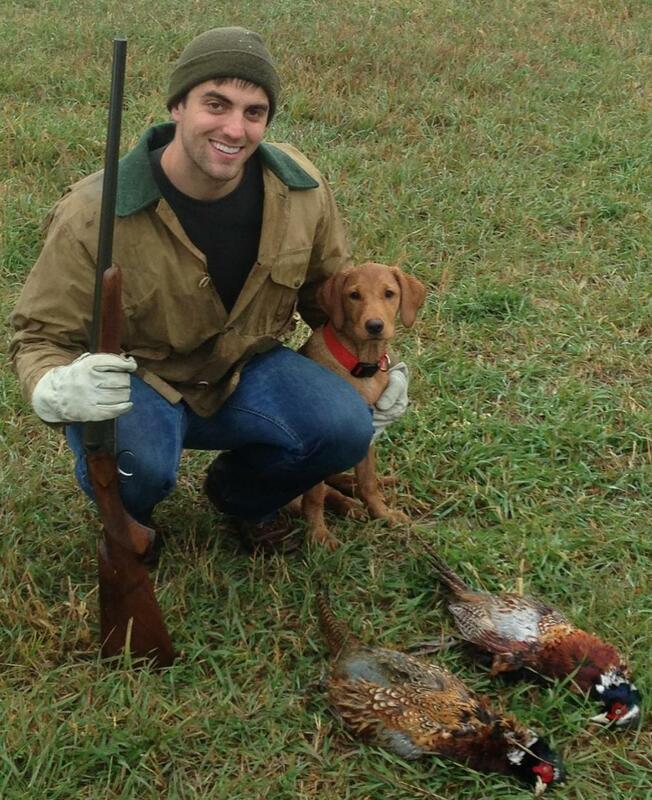 My third year schedule at Creighton law school has provided ample opportunity to find Turner some roosters. He is improving every time out and is extremely intelligent. He is very queued in to what I want him to do, which makes hunting roosters a lot easier. 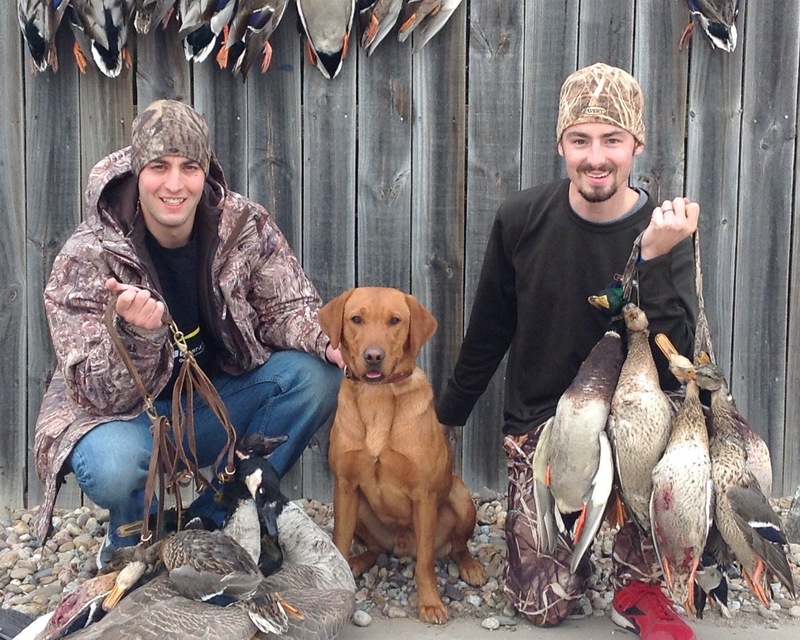 Recently, I let my brothers take Turner for a full week of pheasant hunting/scouting for ducks. They thoroughly enjoy him and recognize his ability and potential in the field. My brothers are still mystified by his calm or as they would say "sloth-like" behavior in the house, as we grew up with mostly american labs. Anyway, we are up to 40 roosters shot over him this year. Probably 15 on our private land and 25 on public/road ditches. With the numbers the way they are in Iowa I feel that this is a pretty good start, but hopefully many more to come. Also, perhap's most importantly. My wife, and him get along great. She love's him to death, and they are alway's together in the house. I know I have told you this several times before, but thanks a lot. This is perfect fit.